I am in the process of making an alphabet book for Olivia (my 5 1/2 year old daughter) for Christmas. This project has been going on now for several months, and is almost done. Each page of the book has 2 ATCs (artist trading cards) – one that I made and one that someone else has made. I’ve been trading cards through a swap on Swap-Bot with different partners throughout the U.S. It’s been interesting to see the different styles of cards that are in the book. This card is one that I made a while back, but it was never traded. Since Olivia likes zebras and loves the tactile cards (she’s legally blind in both eyes and responds better to the tactile/sensory cards), I thought this would be a nice one for her book. It is made with zebra-printed fabric on both sides. 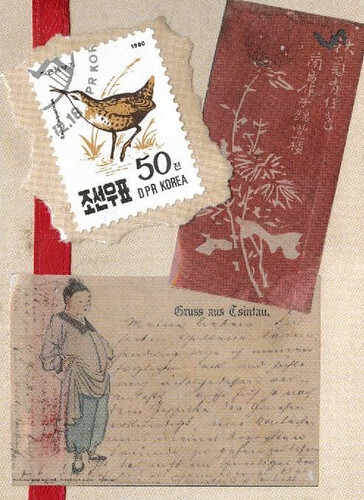 The card is hand-embroidered using the blanket-stitch. 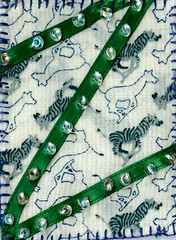 The green ribbon is in the shape of a “Z” and has beads hand-sewn on it. This is an interactive ACEO (Art Cards Editions Originals) that I made yesterday. I’ve been tossing around the idea of how children can interact with art more, and thought of this idea. My daughters have enjoyed making and trading ATCs. Both have Sensory Integration Dysfunction, and have a strong need to touch and feel things so their bodies receive the input that is needed. So…this card combines that need to touch and interact with art. I could tell that it is JUST what they needed when both came into my room and asked me to make one for them. I let them choose their background colors (one chose 2 colors of pink – a light color for the front and a darker one for the back; and the other chose blue for the front and red for the back). ATCs have been a wonderful, sensory learning tool for the girls, and such a great way for them to learn about art. This new card – with the panda finger puppet that they can remove and play with – just takes the cards to a new level for the girls who love imaginary play and puppets. Now a little about the card…the finger puppet and the card itself are all hand-embroidered. The panda is attached to the card by velcro so it can easily come off and be used…and then placed back on the card for a safe place to call “home.” The bamboo leaves are sewn onto the felt card. The card and puppet are made with 100% wool felt. Cotton floss is used to blanket-stitch the puppet as well as the card together. 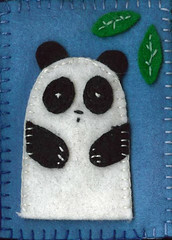 If you’d like this panda ACEO, check out my Etsy shop. A link is to the right. If you would like a panda ACEO, please email me at hmcf@lycos.com or visit my Etsy shop at http://www.harvestmoonbyhand.etsy.com/ where you can send me a message as well. I have a variety of colors of wool felt so perhaps there is another color you would like for the background and backing of the card. Just let me know. I’ve been enjoying making textile artist trading cards (ATCs) recently. This is the most recent one. 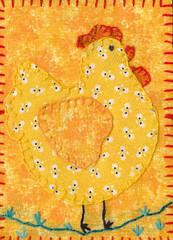 The size of Henny Penny Taking a Stroll is 2 1/2″ x 3 1/2″ – so the pieces and stitching are actually quite small. What I like about ATCs – especially these textile ones – is that it is a great way to use fabric and embroidery floss that you have right on hand. There’s no need to go out and purchase anything. With the economy in a challenging state right now…with gas and food prices so high…it is nice to be able to still create pieces without spending a lot of money. The other aspect of ATCs that I enjoy is that as a mom who homeschools, my daughters are able to see a variety of different artistic styles from creative women throughout the world. They are able to touch these little works of art that come in the mail…something they can’t do when they visit an art museum where you simply cannot touch the art. Having daughters who both have sensory issues (sensory integration dysfunction), ATCs are a wonderful way for them to touch, feel, and get that sensory input they need – while at the same time being inspired by art created by such a diversity of artists. It’s one aspect of art education that the girls truly enjoy. I signed up for an artist trading card (ATC) swap on Swap-Bot that focused on insects. As a result, I made some extra ladybug cards in the process since the favorite insect around here is the ladybug. 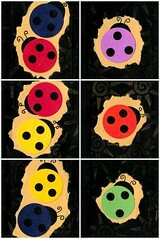 As I was thinking about what to do, I thought it would be fun to make ladybugs in different colors. The ATCs ended up being two-part. The cover, as shown in the picture, is of two ladybugs. The top level of the card has a door that opens to reveal what happens if the two ladybugs collide. More information about the ladybug series – including how they were made are on my Flickr site at http://www.flickr.com/photos/picturesbyann . This site – at http://siblings.adoptionblogs.com/weblogs/ladybugs-part-2 – has some more information about the significance of the ladybug to those in the Chinese adoption community as well as information about how the ladybug is considered to be good luck in many other cultures. There are many cultures that believe if you are to kill a ladybug then it will bring sadness and bad luck. There are those that believe the ladybugs give good luck when you have one land on you or if you catch one. – has information about legends about ladybugs around the world as well as how to say the word “ladybug” in different languages. I’ve been working on Artist Trading Cards recently which has been so much fun. This is my first embroidered card. There are two…one went to Australia for a swap for fantasy creatures (for Flickr’s ATC Beginners group); and the other one went to my oldest daughter who loves unicorns. This card is embroidered, and is the standard ATC size (2 1/2″ x 3 1/2″). 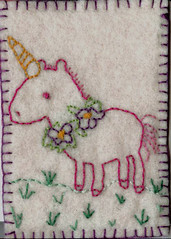 The unicorn pattern is a free one that I found on the internet. Thought it was a cute one. Other cards I’ve done include collage and needlefelted. Visit http://www.flickr.com/photos/picturesbyann and look under “ATC Cards – Available and Traded” for what I’ve made so far. If you trade cards, there are generally always some available. I’ve been making cards weekly so new ones are always being added. Having two daughters who I homeschool, I’m always looking at things from an educational standpoint. ATCs are great in terms of learning about a variety of things. The most obvious benefit is creating art and seeing art made by various artists. Both Sophia and Olivia are learning more about collage and how to combine different elements to make them work together in a eye-pleasing collage. They see such a wide range of artistic styles by looking at the cards I’ve received. ATCs are an excellent way to learn about geography – U.S. and world. I’ve sent and received cards from many different states as well as countries (including Finland, U.K., Switzerland, Germany, and Australia). They’re a great way to connect with others who you would never connect with otherwise. I’ve met other women who homeschool, have children with special needs (both my daughters have special needs), have visited or live in countries I’ve been to, who live in the same state as I do, or enjoy the same types of crafts. Off to make some more cards now! This is a set of alphabet cards that I made for my daughters who are learning how to read and spell (the older one) and identify letters (the younger one). Both are hands-on, visual learners. The four picture cards on the corners are either ATCs or ACEOs that are available (the top 2) or traded (the bottom 2). Each card is the standard ATC/ACEO size (2 1/2″ x 3 1/2″) and is made with 100% sheep wool. The letter and background are both needlefelted with a single barbed needle onto a white wool base. The girls have watched me make needlefelted ATCs (and tried their hand at making their own which is a different story). So, I started by making the A, B, and C cards one night. The next morning, they saw the cards and were so excited. “YES!” Sophia (the older daughter) said. 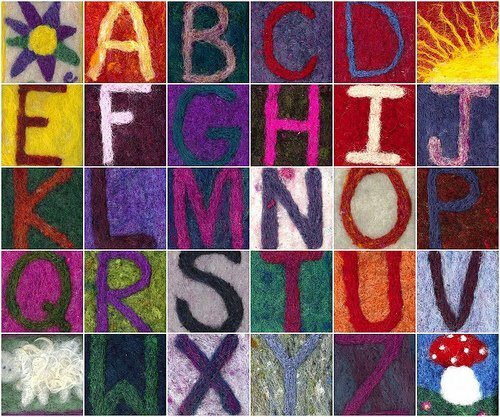 So, I began working on the needlefelted alphabet set. This was a great way to use the many colors that were in the wool bin (I was surprised at how many different types I had as I was making the cards). They are learning…even when I’m not teaching them. It made me smile. For families/teachers/home educators, individual cards and the entire alphabet set that look like these are available in my Etsy shop (http://www.harvestmoonbyhand.etsy.com/). For those who enjoy trading ATCs, if you are interested in trading one of your cards for a needlefelted one, please email me.